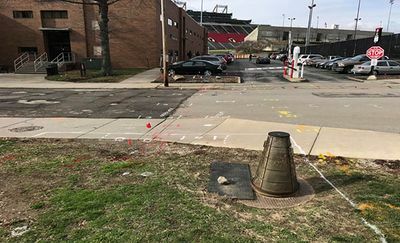 Prior to installing a steam line at Youngstown State University, a construction contractor contacted GPRS to conduct a utility scan. After arriving to the job-site, we scanned the area with both GPR and Radio Detection to locate all of the utility lines at the site. During the scan, we located utility lines such as electrical, communication, chilled water, steam, sanitary, storm, and fire. Next, in addition to locating the site’s utility lines, during the scan, we located an underground storage vault, and an underground tunnel (which were connected to each other). As we scanned the job-site, we marked the results of the scan onto the project surface with spray paint and flags. Then, once the scan was finished, since the contractor needed to have long term record of the scan results, we provided them with both a CAD overlay, and a Google Maps image (both of which depicted the results of the scan). 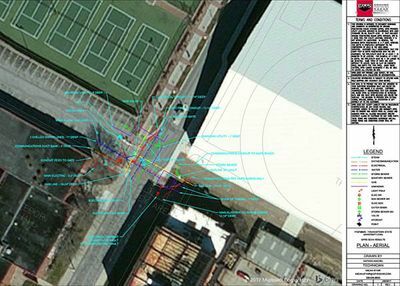 GPR and Radio Detection technologies are great for locating underground utility lines, vaults, tunnels, and other near-surface items prior to excavation. Of course, it is dangerous to dig without having a project area scanned first, and therefore, call GPRS prior to your next project, and we will help you keep your project on time, within budget, and most importantly, SAFE. For a quote, or for more information on the utility locating and concrete scanning services that we offer, please contact your local GPRS Project Manager. For all of your utility locating and concrete scanning needs in or near Youngstown, Ohio, please contact Project Manager, Micah Stair at (330) 639-8933 or by email at micah.stair@gprsinc.com. For projects in other locations, GPRS has offices in every major city in the United States. To view our company directory, click here.